A short, steep climb in the dark took me to the open circular terraces crowned with 72 stupas to watch the sunrise. Around me roosters crowed in stereo, and birdsong filled the still morning air. It was overcast, so any hope of a spectacular sunrise disappeared with the receding darkness. A group of Buddhist tourists circumambulated the stupa, chanting. Building work began around 760 CE, and lasted for more or less seventy years. Without a single blueprint, each new generation of the Sailendra kings, made their own modifications and inventions. 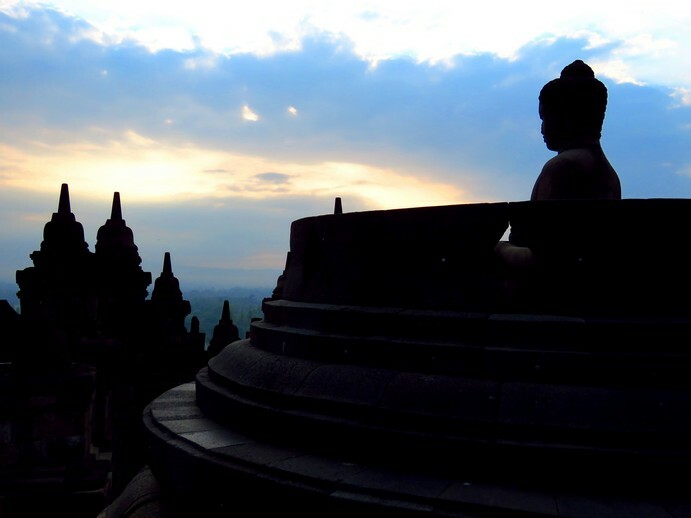 And once it was done, Borobudur was the biggest Buddhist monument on earth. It still is. This monumental mandala, standing at the junction of the Progo and Elo rivers, was the last piece of puzzle of my ancient Buddhist temple quest, falling into place. Angkor. Bagan. Borobudur. People milled around, gazing towards the east. Hoping for a break in the clouds. Posing. Each tried their best to capture the fleeting moment. Immortalizing it with the click of a shutter. A young woman had her small point-and-shoot on a multiple-shoot setting. Every time she pressed the button, a tiny machine gun fired at the view. Not much is known of the Sailendra kings, who built this unique temple, and their source of power and even ethnicity are heavily debated. What we do know, is that they vanished almost as quickly as they appeared. 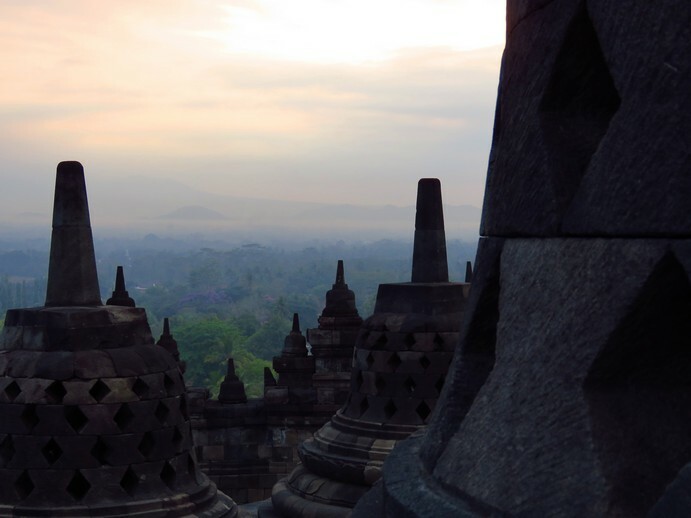 Borobudur was built by a clan of orthodox Mahayana Buddhists in a time, when the majority religion on Java was Hindu, and still stands proud in a time, when the majority religion of Indonesia is Muslim. It is not an old, forgotten Buddhist monument, frequented only by tourists, but an active place of pilgrimage and worship, especially on Vesak day. Not only is Java one of the most earthquake prone places on the planet, but also one of the most volcanic. It is therefore no surprise that Borobudur was completely abandoned in 1006 CE, after a severe earthquake and large eruption of Mount Merapi. But in one of those wonderful twists of history, the cause of its demise, was also what helped to preserve it. 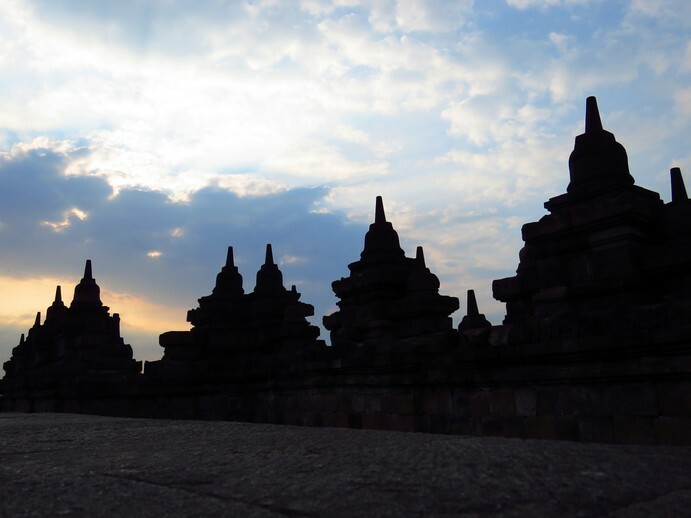 In 1814, Sir Thomas Stamford Raffles, the new British Governor of Java, intrigued by the stories and architecture of Indonesia, ordered the excavation of Borobudur. It took two hundred men six weeks to slash and burn through thick vegetation, and clearing away tons of volcanic ash to uncover it. Sadly, souvenir hunters decapitated most of the Buddha statues to ship them to museums and mansions all over the world, while the local villagers, no longer kept away by superstitions, plundered the monument for building supplies. Well-intentioned restoration attempts by various Europeans cleared it from sediment and plant life, but the porous volcanic stone stood vulnerable against the onslaught of torrential rains, and as a result, suffered more damage than it did in the previous thousand years. With the help of UNESCO it was eventually restored by the Indonesian Government in the 1970s. A massive undertaking that involved the complete dismantling and rebuilding of the lower terraces of the temple, moving a million stones as if they were giant puzzle pieces, while the carved panels were individually cleaned, catalogued, and treated for preservation. Experts in archaeology, engineering, biology, and chemistry from twenty-seven countries assisted in this enormous task to solve multiple problems and challenges. And to make it possible for me to stand at the top of 1.5 million blocks of chiselled grey andesite, on a late October morning. Built as a three-dimensional guide to enlightenment, the idea is for pilgrims to walk clockwise along walkways flanked by carved reliefs to mediate a physical and spiritual journey, slowly progressing toward higher states of consciousness. Built as nine concentric terraces, the first six are square, representing the world of desire (kamadhatu) and the world of forms (rupadhatu) in Buddhist cosmology, while the upper three form a set of shrinking circles culminating in a single stupa, representing the world of formlessness (arupadhatu). My journey took me on a reverse pilgrimage. Ascending first to the world of formlessness in the dark pre-dawn morning, but as the shapes of the world materialized, and the morning grew hot and humid, I descended slowly through the open air passageways covered in around 2,500 individually carved panels, amounting to a strip of stories, 5 kilometers long, back to the bottom and the realities of life. Borobudur, when gazed upon from ground level is squat, almost ugly, but when she holds you in her embrace, her beauty takes your breath away. ** Entrance fee (for foreigners) for sunrise is through the Manohara Hotel only, and costs Rp 475,000. It includes a light breakfast, and the use of a torch for one’s visit. Tickets can be bought on the morning of one’s visit from the hotel. Remember to also sign up for our adventures in Portugal, A Taste of Freedom, where we are in the process of rebuilding a ruin into a tiny house. All while we are still residing in the UAE. It is a long-term project, as we do not have unlimited resources, and only progress as fast as we can put money aside for the different steps required. We also have a Facebook page for it. So, please join us on this adventure of transforming a dream into a reality. Thank you, Rob. It is a special place. I am jealous! I want to go so bad. I have been to Bali but would really love to go here! Thanks for the post! It is definitely worth a visit. Hope you get an opportunity to visit one day. It is indeed a beautiful place, Pooja. I must visit. After Ankor best more? made me wince. I cannot count the number of times I’ve seen a Buddha’s head, obviously broken off from a larger statue, in a museum or antique shop. I wonder how many of them belonged to a statue at Borobudur. I guess we will never know how many of those come from Borobudur. Thank you, Tanja. They are wonderful places of incredible architecture. And very interesting stories to tell. I waited much of my life to be able to see Angkor Wat. I didn’t know about Borobudur, and could have gone to Java earlier, but eventually go to both, for which I am grateful. There is so much beauty in the world, just not always enough time and money to experience it for oneself. It always seems that my list of places to see, instead of shrinking, is growing. Although it is unfair to compare these places, Angkor holds a special place in my heart, despite it being inundated with tourists. As someone who has made the rounds of many Tibetan Buddhist pieces of the puzzle, I can assure you all three places you mention here are prominently on my travel list to plump up my Buddhism experiences and understanding. They are just sooooo far for me! I guess Tibet and Nepal (and next up, Bhutan) are far, too, but they have very tall mountains also, which moved them up the list – haha! Your photos and descriptions are beautiful. Thank you, Lexie. Ah, Bhutan! I can’t wait for those posts, Lexie. Both Bhutan and Tibet holds an allure for me, yet, unless some real opportunity presents itself, they are not places I would seek out necessarily. I always find it interesting what makes it onto my bucket list that I consider to be ‘real’, and not just a far-off dream or maybe. It also changes all the time, but I’ve decided I need to tick the things off I want to see in this part of the world now, before moving to Portugal, as, like you say, I would think that they are too far then. It really is a very special place, Paulo. You write so beautifully, Jolandi! Thank you so much for the tour of this wonderful place! Thank you for the lovely compliment, Clare. I am so glad you enjoyed the tour. Although you said there were other tourists there, I like how your photographs make it look deserted. So glad I could take you with me to this very special place. Fascinating. Always good stuff from you and to a place I had never heard of, as well! Which reminds me – have you ever read The Lost City of the Monkey God? It strikes me as something you’d very much enjoy. I loved it. You hit the sun just right! 🙂 It was a special start to my day. Interesting! Good for you to see those wonderful places from the past. Absolutely love visiting these old temples, Evelyn!